When Giorgio Vasari was writing and revising his Lives of the Most Excellent Painters, Sculptors and Architects in the mid-C16 he travelled extensively across the Italian states, visiting artists and viewing their works. But inevitably he focused on the major cities and thus never visited Bergamo, north of Venice and close to the Italian Alps. 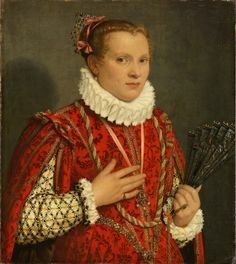 As a result, it would seem that he was never directly aware of the work of Giovanni Battista Moroni (c.1520/24-1579/80) and made no mention of Moroni is his book. Largely as a consequence, Moroni has always been regarded as a second order Renaissance painter, interesting but perhaps not that important. Nothing changes; in the C16, as in the C21, building a reputation with the major patrons and critics was a key part of developing a successful career. An artist in a provincial city, patronised primarily by the nobility and gentry in that province, was never going to develop the sort of following that a Titan or a Veronese was able to build. This exhibition at the Royal Academy is the first large-scale survey of Moroni’s work to be shown outside Italy, though he is already well-represented at the National Gallery. The exhibition clearly intends to putt he case for him to be considered a significant Renaissance figure, at least in his chosen areas of portraiture and religious painting. And to a great extent, it succeeds in its aim. There is much to enjoy in the exhibition. Apart from a brief stay in Trent whilst the Council of Trent was in session, Moroni travelled little. He was born in Albino, trained with Moretti in Brescia, lived for many years in Bergamo and returned in his later years to Albino. The three cities are close together, not far distant from Milan to the west but actually part of the Venetian Republic. His visit to Trent clearly imbued him with the principles of the counter-reformation which are distinctive in his religious paintings. The distinctive nature of his portraiture was his naturalism and his ability to catch a character. When you look at his portraits you feel you looking at a living human being and you are in no doubt as to the character of the person being viewed. He doesn’t flatter with idealised images; instead he brings people to life across the centuries. This ability is apparent from the early stages his career and is wonderfully demonstrated in a portrait of an elderly donor to a church, Lucrezia Vertova Agliardi, painted in 1557 when he would have been in his mid-30s. 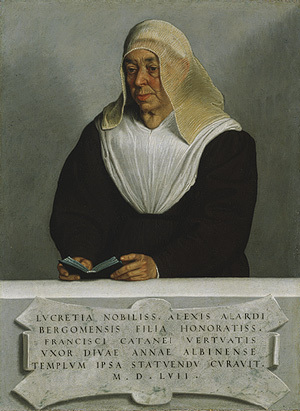 It is a wonderful picture of an obviously wealthy but humble and devout woman, contemplating her prayer book. Moving to Bergamo he became the favoured portraitist of the leading families in the city. And there is a room in the exhibition devoted to these aristocratic portraits. These required as much skill in properly rendering the fashionable fabrics and clothing as in capturing a true likeness and he shows himself the equal of the best Renaissance painters in creating a sense that you could reach out, touch and fold the fabrics. 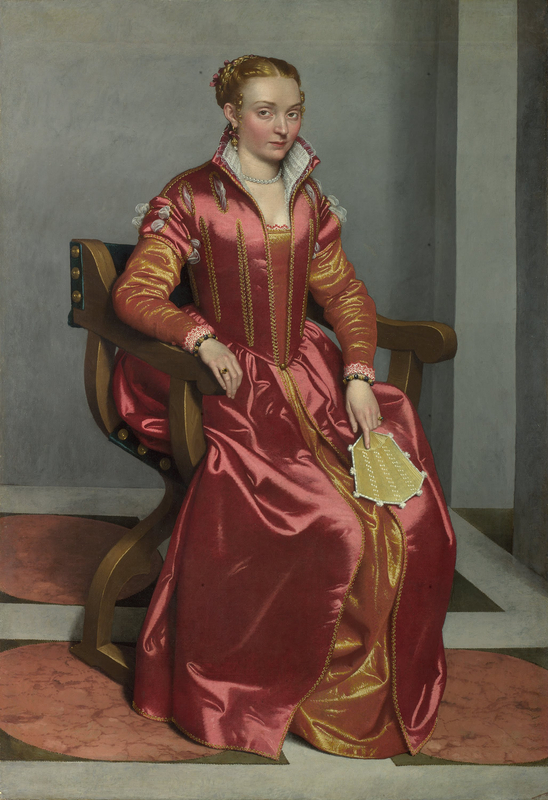 To my mind the best of these paintings are those of his female sitters, with the portrait of Lucia Albani Avogadro (The Lady in Red) being particularly memorable. His portraits of men all suffered to some degree from a similar problem. The heads and the bodies appear to have been developed separately and stuck together. There are inconsistencies of scale and an absence of neck which makes you wonder about how these were constructed. Are these examples of the problems David Hockney describes of constructing images with the support of optical devices which do not allow you to address the whole figure at once. The issue is particularly marked in the portrait known as The Unknown Poet. 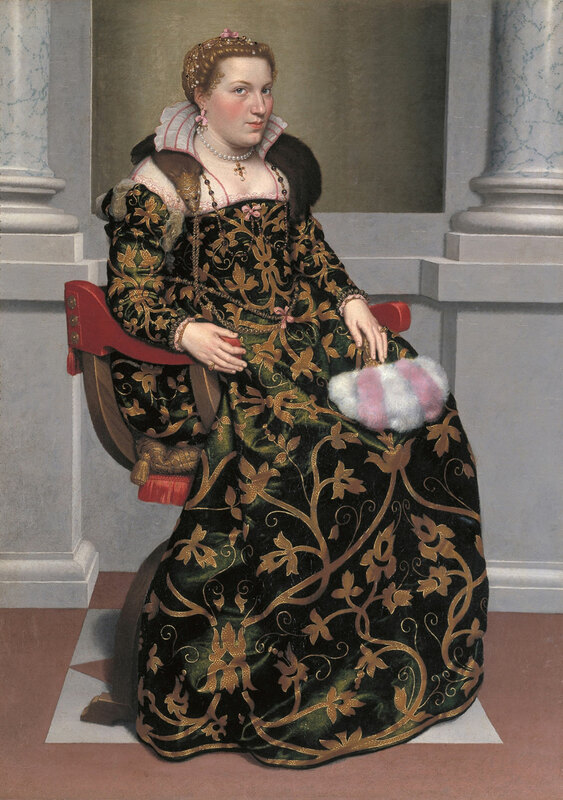 An interesting part of Moroni’s work is that he did not restrict himself to aristocratic portraits. He also painted a significant number of smaller ‘head and shoulders’ pictures of gentry in the city. Some of these are very powerful and perhaps even more effective that the large scale aristocratic pictures. I was particularly struck by the portrait of Lucia Vertova Agosti. A simple portrait on a plain grey background her character – as a woman of resolve who clearly knows her own mind – leaps from the canvas and arrests you across the room. His portrait of a Young Lady with a Fan is equally arresting. Moroni also painted a significant number of religious paintings, both altarpieces and smaller devotional pieces, presumably for private use. The latter are more interesting in my view and allow his to exploit his skills at portraiture as well, as in his picture showing a man in contemplation before the crucifixion, a neat compositional trick for drawing the patron into the painting. All in all, this is a very nice and comfortable show. There is plenty to see, but not too much. The work is of a consistently high quality. And whilst in the end you have to conclude that Moroni is no Titian or Veronese, if for no other reason than a modesty of ambition, he certainly deserves to be considered amongst the first order of Renaissance painted. Well done to the RA for putting on this sumptuous display. 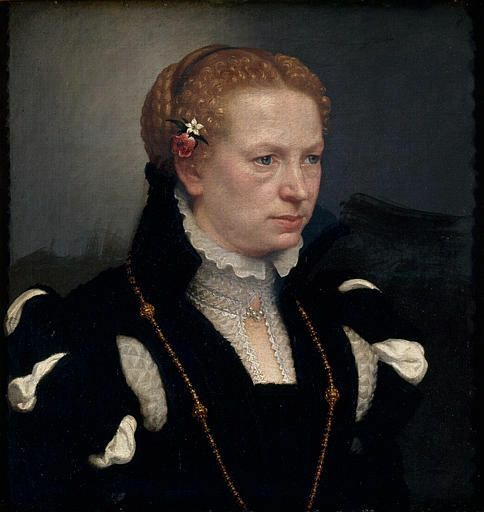 Posted in Art, Exhibition Reviews and tagged Bergamo, Moroni, review, Royal Academy. Bookmark the permalink. Such nice portraits! I like the Benjamin West, The Death of General Wolfe at the Royal Academy. West could not have known the painting would become one of the greatest art achievements in the 18th century.What do you think?